Lionel Messi, Cristiano Ronaldo could be teammates? 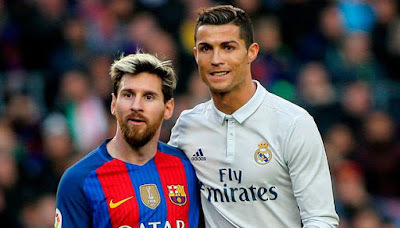 HomeSportsLionel Messi, Cristiano Ronaldo could be teammates? Barcelona president Josep Maria Bartomeu feels Argentina star Lionel Messi and Portugal great Cristiano Ronaldo would be perfect teammates despite their rivalry. Bartomeu also feels that the duo would not have a problem playing alongside each other. Both Ronaldo and Messi are counted as the best players of this generation. With 10 Ballon d’Or awards between them, the duo dominated the football stage for over a decade. El Clasico matches were must-watch games due to Ronaldo and Messi’s on-field rivalry. Messi and Ronaldo’s La Liga battle ended last year when CR7 left Real Madrid for Juventus in the summer. Barcelona chief Bartomeu also revealed that they are not planning on letting Messi walk out on the Nou Camp club any time soon. “There will be another renewal of Messi, not this year. We have Messi for many more years. He is the best player in history,” Bartomeu added.